A very cosy room, dim lights as if to further highlight the colors that radiate from every inch of the house, the walls decorated with paintings, prints and cabinets stacked with unique mugs, seemingly similar, but discernibly different in pattern when viewed with a keen eye. This was the scene that greeted me as artist Stephanie Borg welcomed me into her Rabat home. Malta Inside Out has been intrigued by Stephanie’s work for some years. We track her down to ask about her fascinating work. Stephanie Borg is a self-taught artist and surface pattern designer from Malta. As a child, she loved to draw; art has always been part of her and despite the few hours school curricula devote to art, she had developed a strong passion for the subject early in life. Stephanie didn’t attend specialised courses, but she did spend hours pouring over books, informing herself and pushing herself to try new techniques. Her life experiences, traveling frequently out of Malta, allowed her to mature artistically and to change her outlook and her style of painting. Stephanie lived in the Bahamas and Florida, passed through Italy and lived for about six years in the Sultanate of Oman. These varied landscapes changed Stephanie’s artistic leanings; the many open spaces and voids of her adoptive homes gave her art a strong sense of freedom as she explored environments that seemed to have no limits. Her new horizons opened up views of urban life too with its accompanying cacophony of peoples and cultures and also glimpses of the ravages of poverty. In Oman, Stephanie started down a completely new route in her art, her sense of curiosity aroused by the stark differences in the Omani culture from her western roots. She started to paint the traditional dress of the local women with its vivid, ‘alive’ colours. 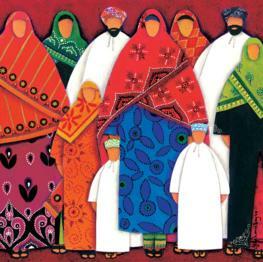 With her work well received, and ever the innovator, Stephanie decided to branch out creating a series of greeting cards depicting her work in Oman. In 2008, she returned to Malta where much had changed in her absence. “In many ways, Malta was so new to me that I felt like a tourist for the first four years back ‘home’!, Stephanie says. “I found myself able to see everything from a different point of view, perhaps in a more special and less routine and mundane way than before.” Her heightened awareness of what Malta had to offer artists, prompted her inspiration. She started to paint everything that she saw around her and she once took as familiar; doors and balconies so typical of the islands; women who chat to each other on their doorsteps; scenes of everyday life and reality. Doors, in particular, caught her attention. “They are usually painted such bright, yet harmonising colours. 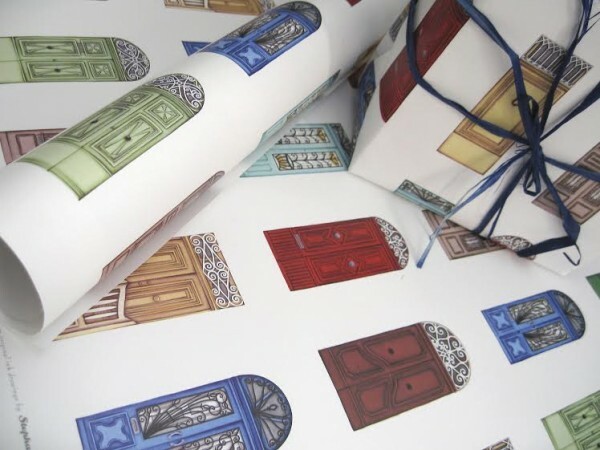 Each door has its own specific detail that distinguishes it from its neighbours,” Stephanie explains. It’s as if the doors have their own personalities and Stephanie approaches painting them as she would portraiture. Stephanie takes photos of the details to ensure she doesn’t lose anything in translation to her art. “I think it is rooted in my subconscious to make sure that the images and the feelings of seeing the actual article or moment – door, balcony, street life scene – get together and cross over faithfully, yet with my interpretation, into my art”. She paints in solitude, and accepts few distractions except for some music to help her retrieve the emotions that inspire her painting. Her choice of music depends a lot on her specific mood and the object of her painting. Stephanie is not only self taught artist, but also extremely self-sufficient in all she does, especially in the past year or so which has seen her branch out into products based on her paintings. She is meticulous about the production, quality and framing of her prints, as well as the development of her latest creations – mugs stamped with her colourful images of traditional Maltese cement floor tiles. “The most difficult thing was to determine the price, and to offer the right balance between good quality and affordability,” says Stephanie, adding that she asked friends and family for their take on what would be what feasible. “I always try to be innovative, to find new things and to arouse curiosity in in people through visuals that remind them of Malta, but in product that differ from those we generally find on the market. My paintings ‘celebrate’ something that is here in Malta, something alive and real,” Stephanie says. About the future? 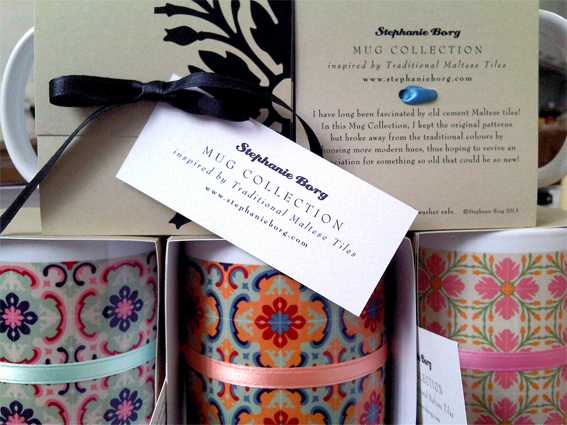 Stephanie doesn’t rule out getting her creations marketed abroad, as the Maltese market is limited. “I’d like to bring the tradition of my native country to people overseas in a different way from the conventional,” she says. Knowing Stephanie’s talent, drive and determination, we may well see her works across the world! Christmas Open Studio. Sunday 30th November, 2014 from 10am till 5pm! Along with my Original Ink Drawings, Prints, Art Cards, Wrapping Paper, Mug Collection and Mousepad Collection, I will also be having my Limited Edition Christmas 2014 Mug, and a brand new product ~ I’m very excited to announce my new Espresso Cup Collection being launched this Sunday at my Studio. So enjoy a nice drive to Rabat this Sunday! Feel free to simply come and take a look, or exchange a chat whilst sipping at some coffee. And if you want to start ticking off your Christmas shopping list, it would be my pleasure to help you out. Mob: +356 991 61469 (call Stephanie for an appointment to view her paintings, prints, paper and mugs).